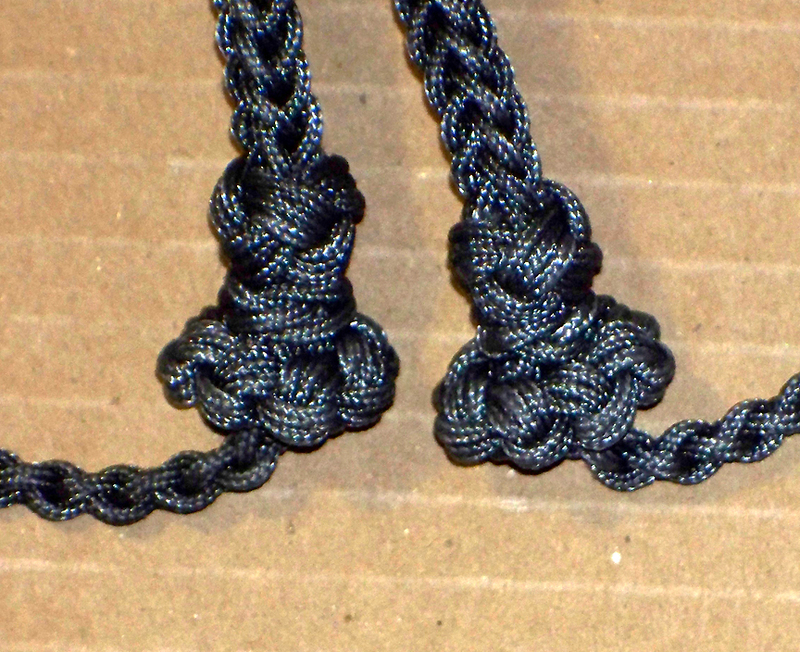 round ball (tight footrope) to an 8-strand square to yet another fender-hitch/footrope combo with the call loop. Thanks, Jimmy... ahh... Chief... ahhh... 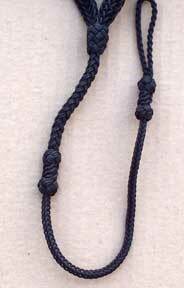 Rev.! 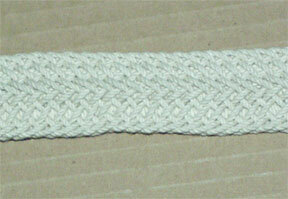 breast pocket of the jumper or jacket. 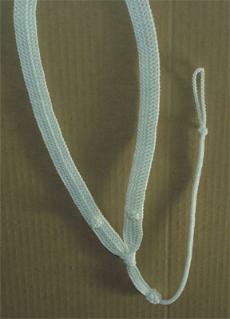 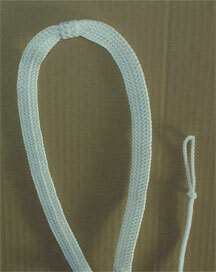 This one is of 1.2mm nylon white round-braided cord with a core. to a footrope knot transitioning to a 4-strand call loop. 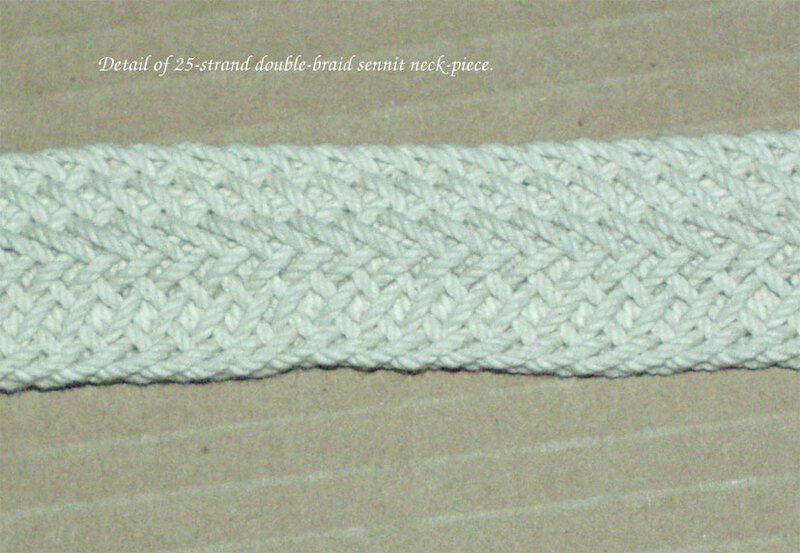 Neckstrap is appx 1/2" wide x 3/16" thick. To start with, a couple of more complex lanyards: I will be adding simpler (and less expensive!) 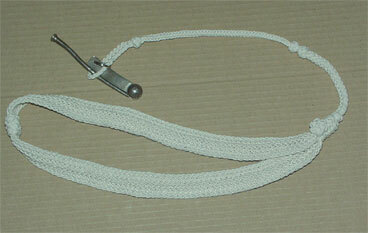 lanyards as time goes along. 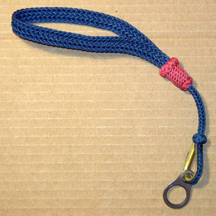 To be notified as new items are added to the page, send me an EMAIL and in the subject line put "Lanyard Notifications". 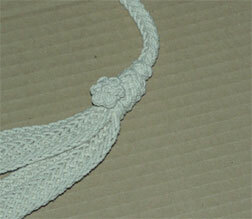 going overboard, but it rapidly became a work of art and a point of pride for the wearer. 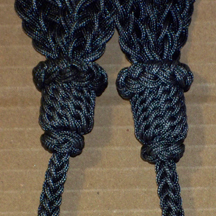 one is designed with the Chief's dress jacket in mind, but it may certainly be worn by any rating entitled to do so. 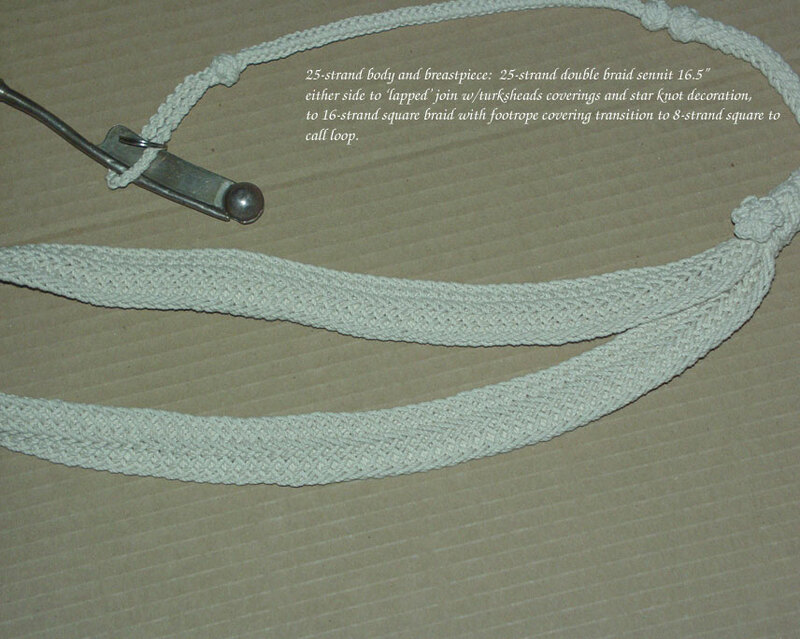 All lengths are custom and subject to change at your desire. 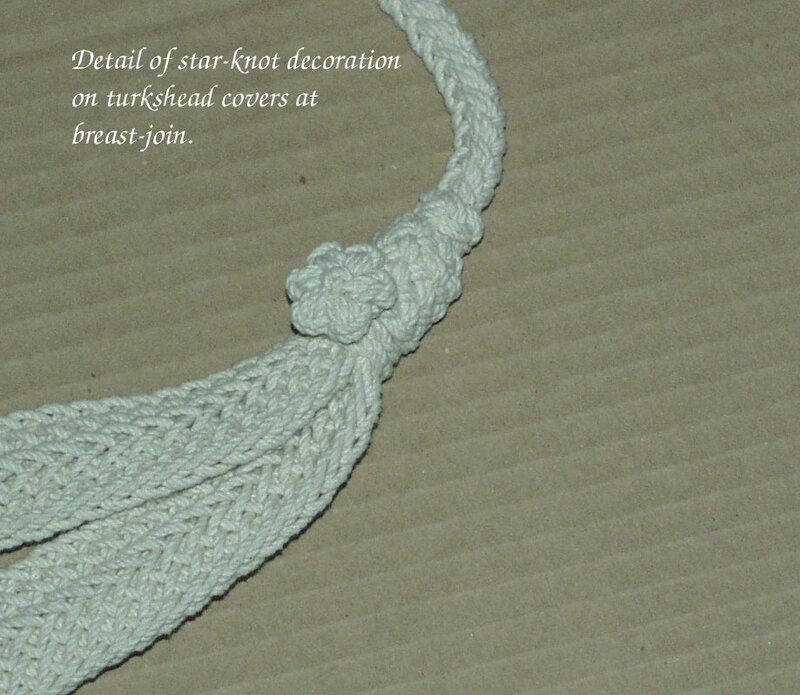 Star knots may be added at additional cost. 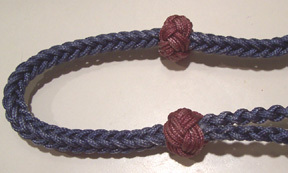 with, EMAIL me. 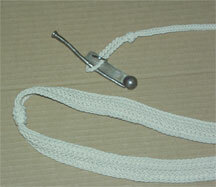 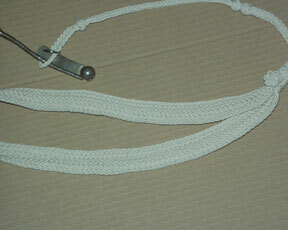 This lanyard is of #15 cotton line made for fancywork use. 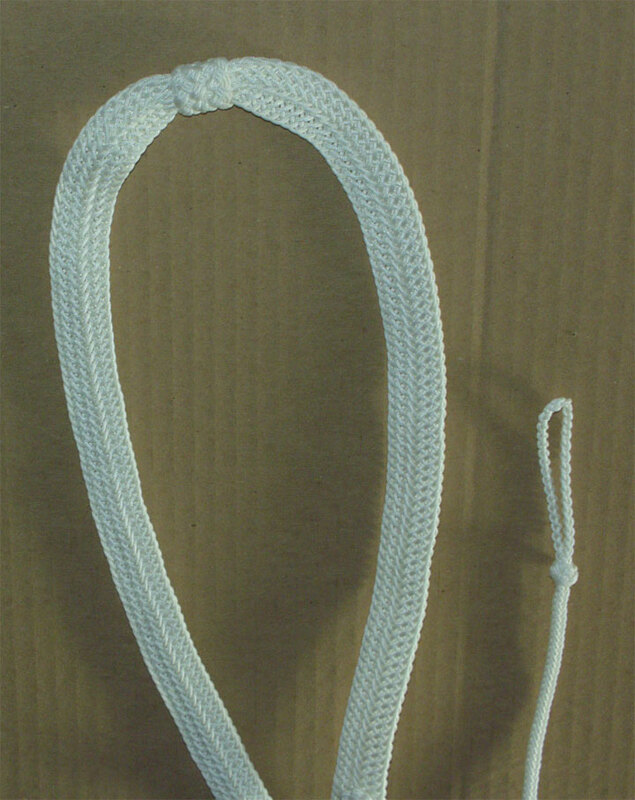 uniforms. Sorry the black one is so 'pixellated', but I'm a knotter, not a photographer! ornate neckpiece or breastplate will distract from any errors, but here we have a 'plain' steam-gasket braid. 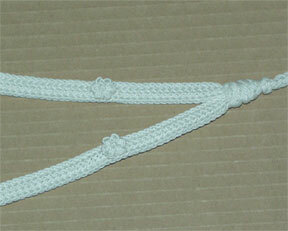 These are available in white or colours as you may choose. 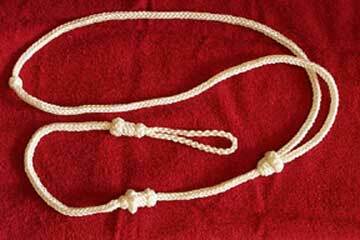 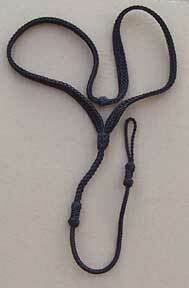 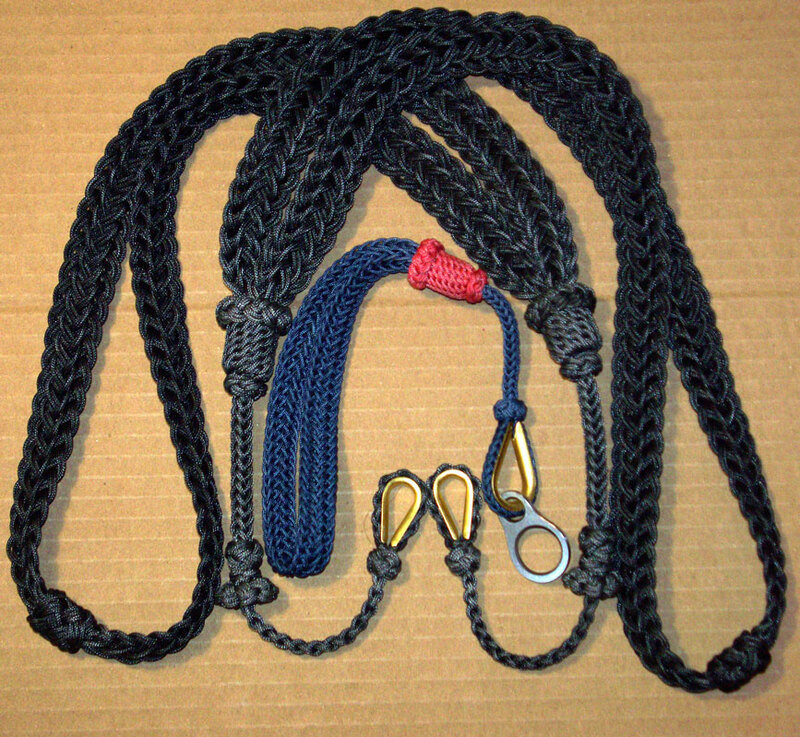 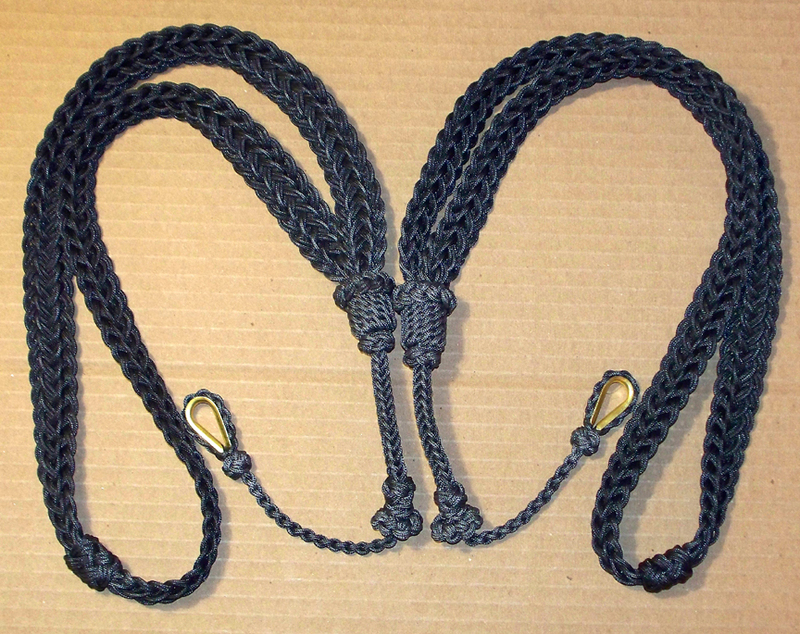 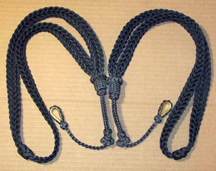 The one pictured is of 1.8mm soft braided nylon, 18" neckpiece, 14"
strop, 3.5" call loop. 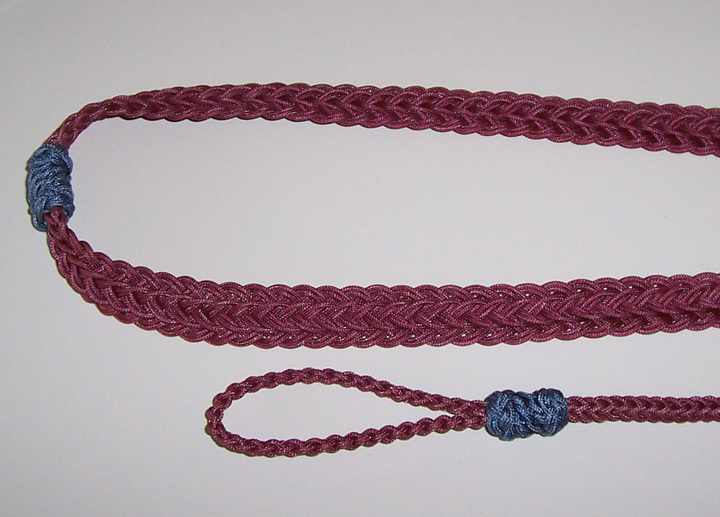 I prefer doing these from 1.4mm hard-braid cord, but the soft-braided 1.8 makes a very nice lanyard as well. 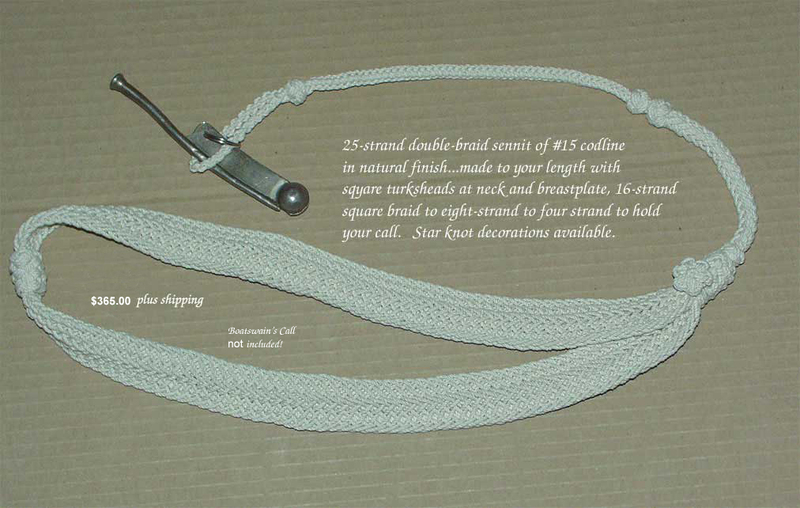 $115.00 @ Three days lead time if not in stock. 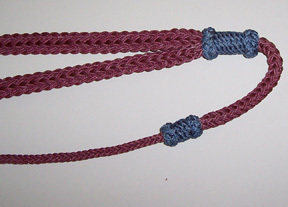 A blue and maroon "French braid" lanyard suitable for either dress whites or as a working dungaree lanyard. 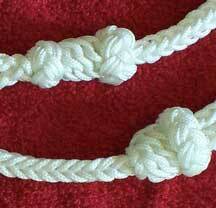 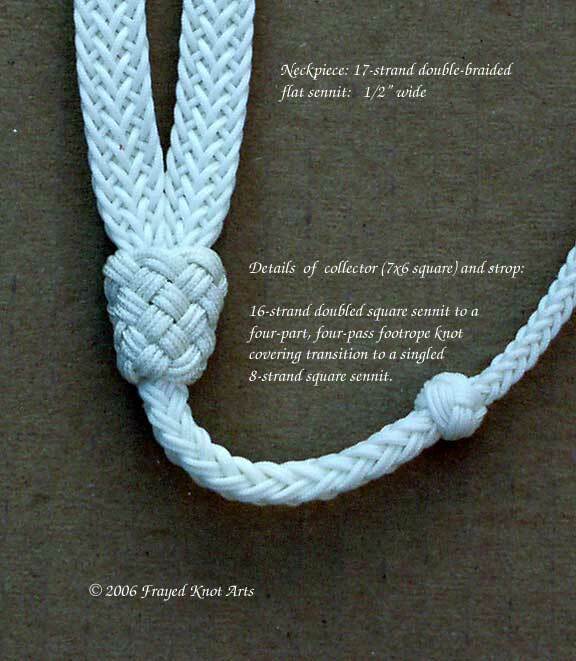 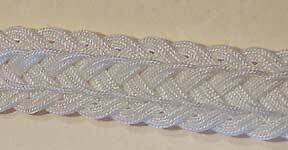 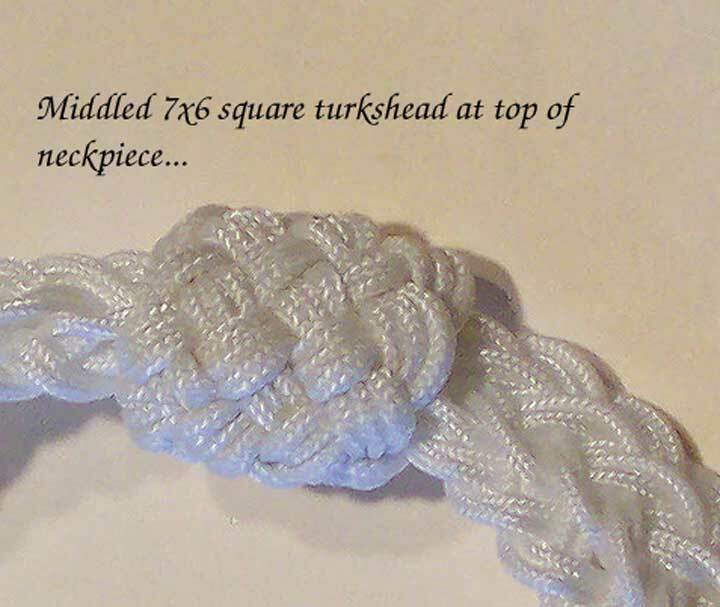 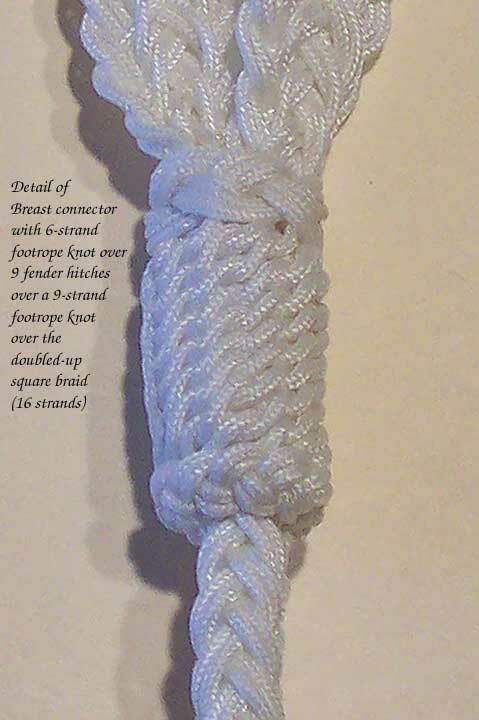 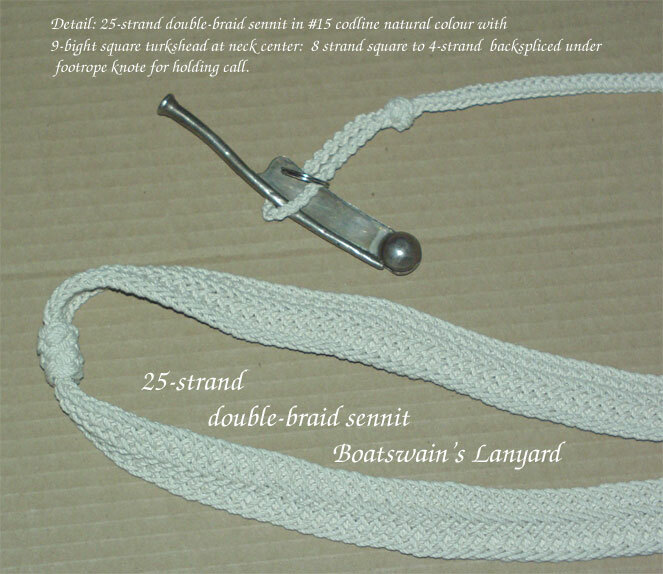 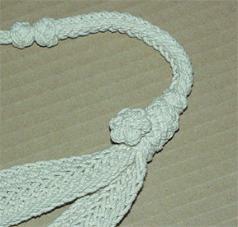 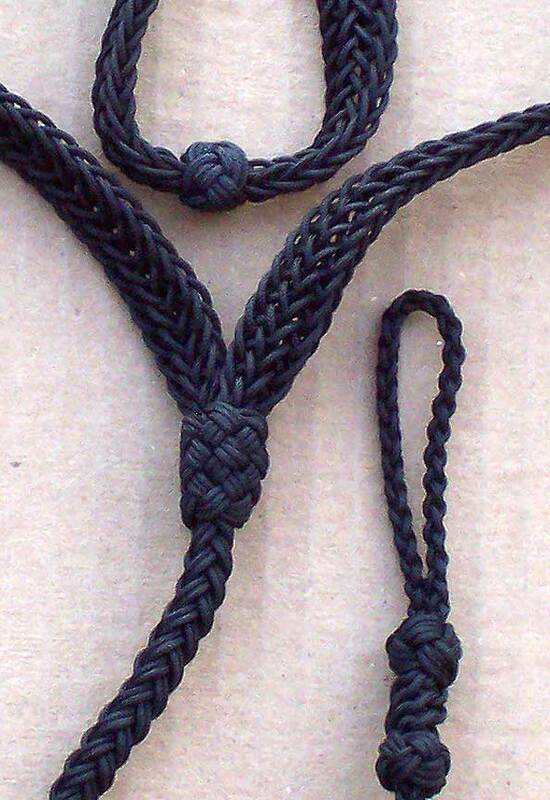 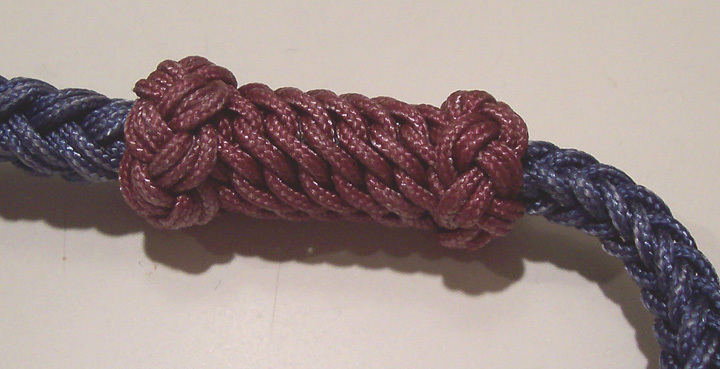 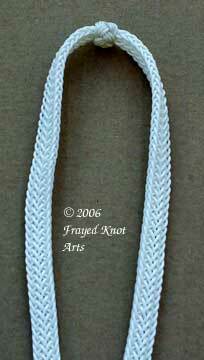 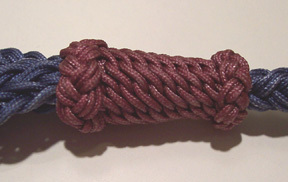 Applied footrope knots at the loop splice and as a decorative item at the midpoint on the 8-strand strop portion. 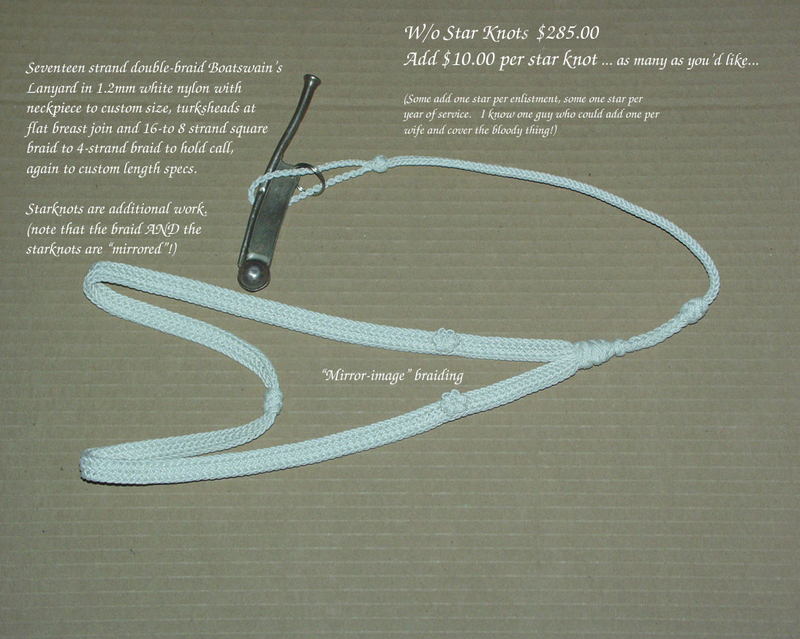 Additional fancy work can be applied, the breastplate can be modified.... your choice. EMAIL me for a consultation! 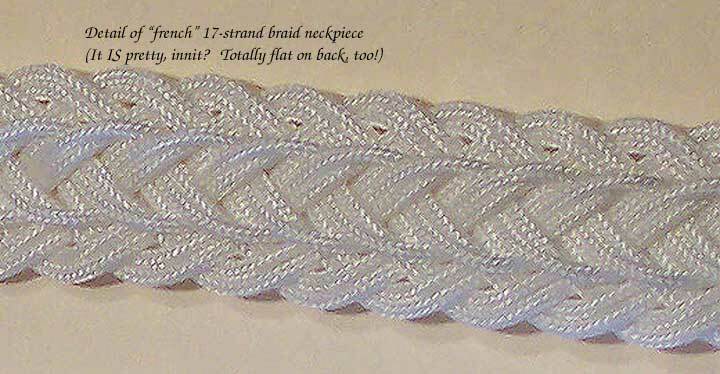 A recent question that sorta frosted my gonads: "Dontch'a think that's a lotta money for some string?" 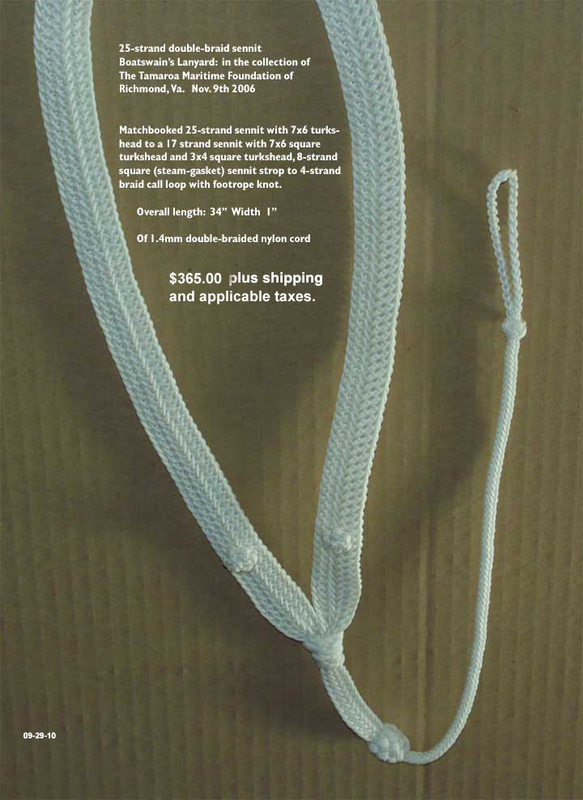 even paying myself a lousy $10/hr, that's a measly $190. Any of you willing to work for ten bucks an hour? lanyards work out to VERY little profit for me. 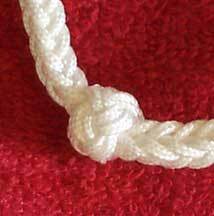 get to buy a drink or two at the local, pay back money to a couple of folks and like that there. 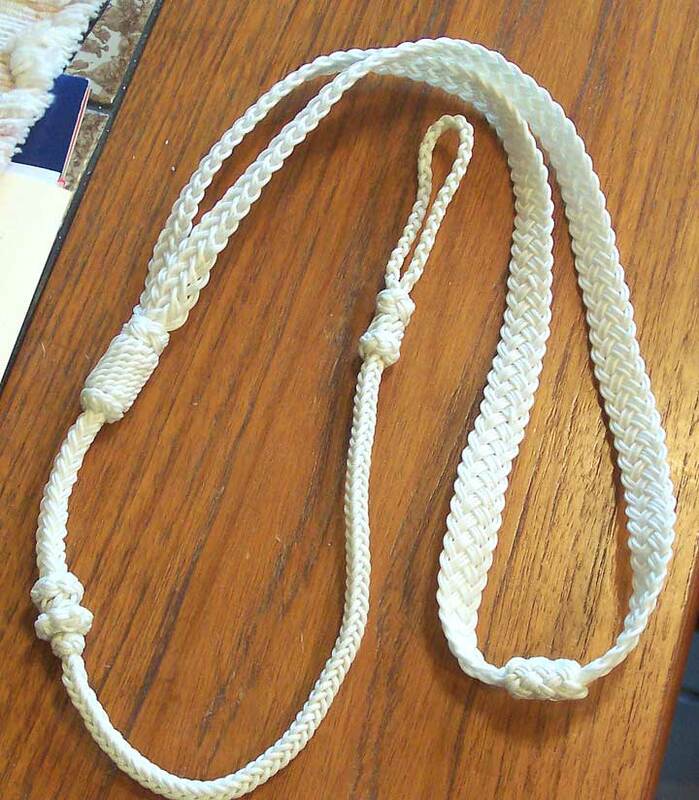 Yeh, it's a lot of money. 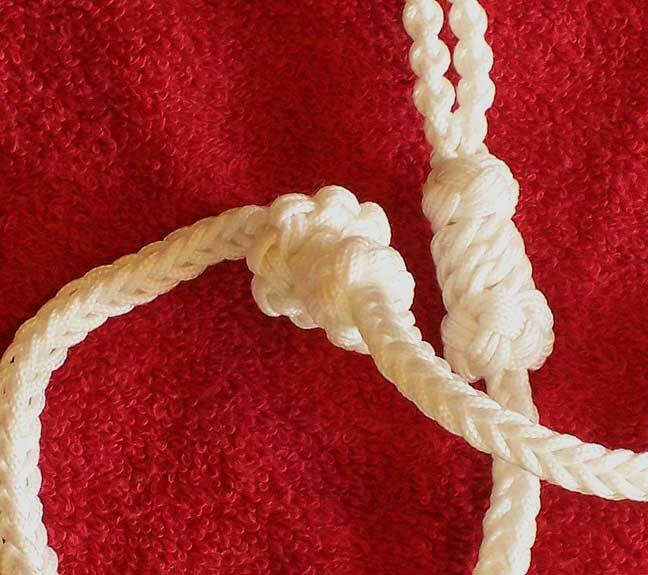 Wenn ich machte es billiger, würden Sie nicht wollen, dass es, Bruder! 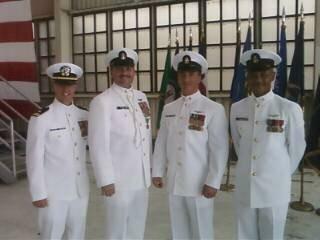 the retirement that's got him grinning so! 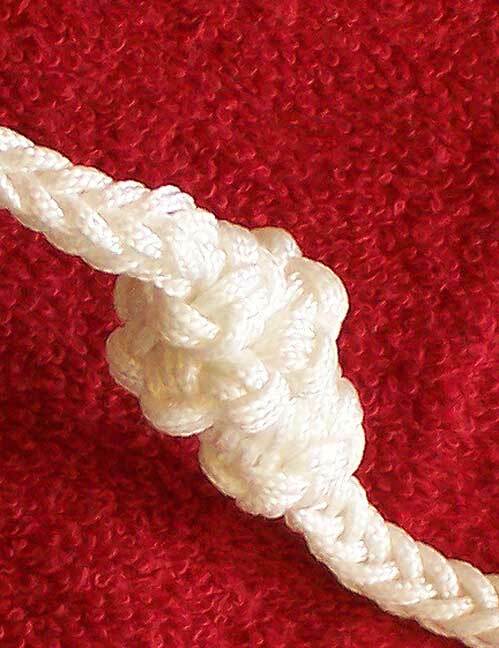 takes a very good eye to see it. 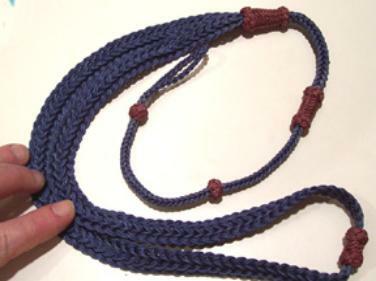 collector, I did it in blue and red. 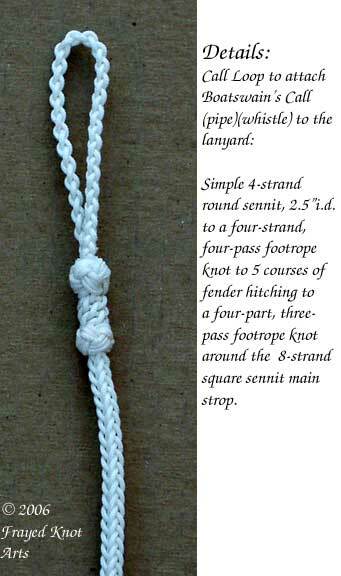 doing the work - let's us all use MY terminology for the present, OK? 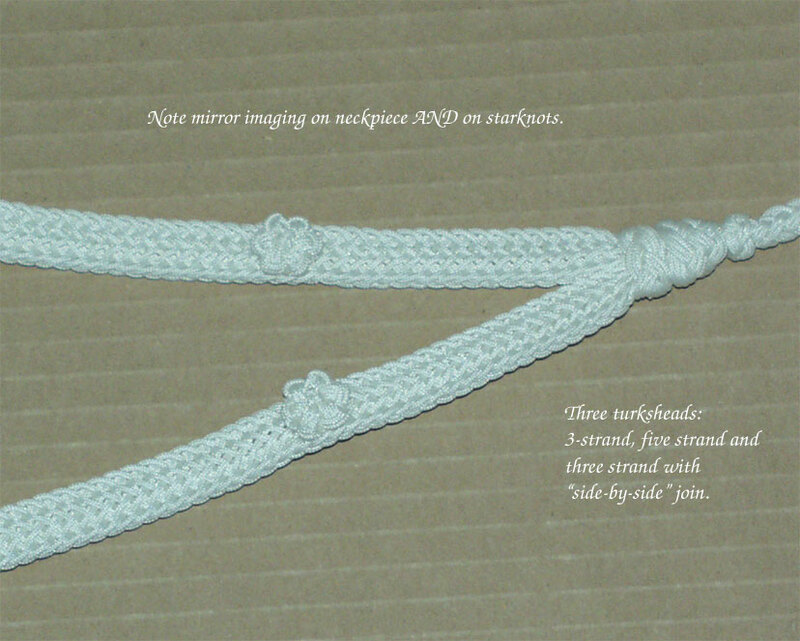 get a "mirrored" or "matchbooked" appearance. 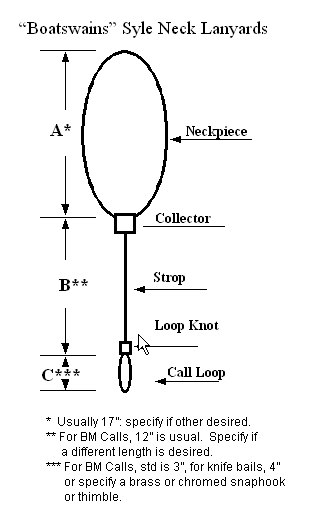 coat / working shirt pocket. 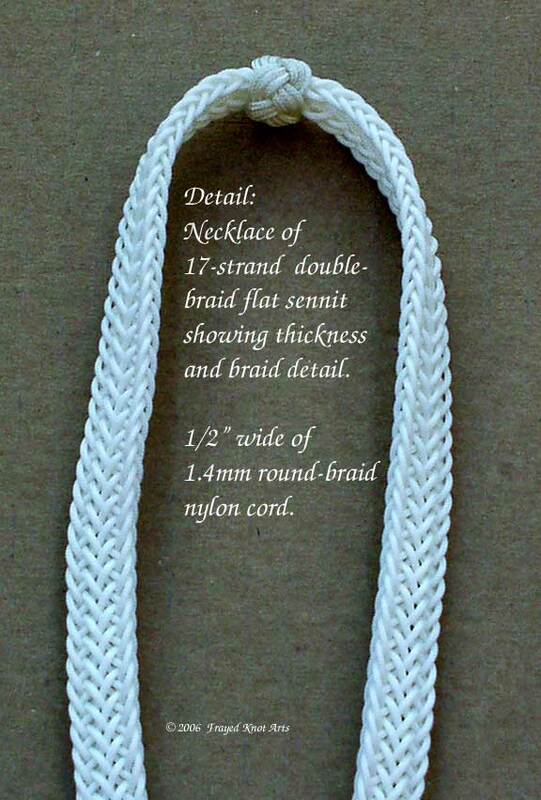 dimensions you wish to use.